I wasn’t sure I’d really be able to convey the visual of the Brimia whipping onto Bocce’s street, but I’m really glad I was able to. I think it works because of the key set-up on the previous page in panel 5, since that panel shows the two of them on parallel streets with occasional connecting alleys between them. That’s one thing that really bugs me in action movies these days: that annoying trend of filming action so tightly and editing it so spastically, that you can’t even tell what’s going on. I’m looking at you, Bourne Supremacy and every Wesley Snipes action movie. It’s a real shame when you can tell something is really well thought out and choreographed only to be mangled into an indecipherable mess. And it’s really not necessary. If an action scene is planned well, it doesn’t need all the quick edits to add to it. Similarly, with comic storytelling, sometimes you need that long shot to set up the spacial relationship between characters (or ships) and the environment around them. Without taking the proper time to set up the space of the action, I think the action itself is pointless because then it’s just visual noise. I don’t watch many movies, but I’ve definitely read actions scenes in comics where I couldn’t tell what was going on. What a waste! 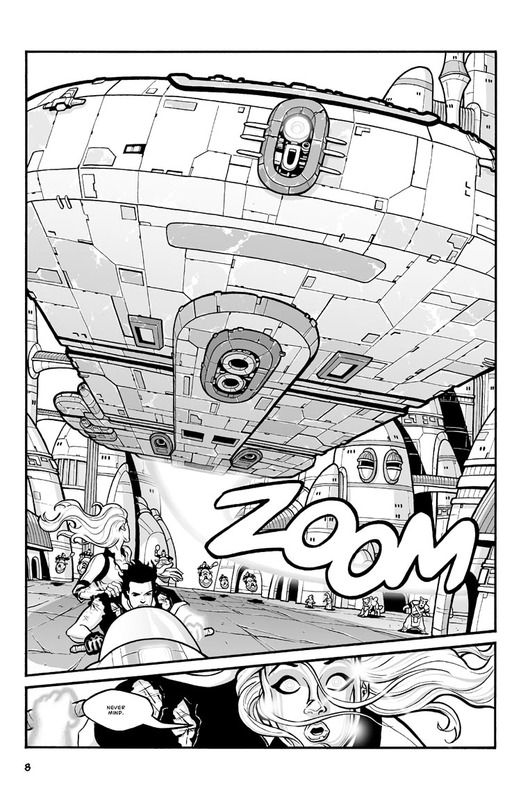 I like how I can practically feel the ship overhead in the first panel. I couldn’t agree more about that trend in modern action movies. That failing is what hurt the new Star Wars trilogy in my opinion (well, that and nearly everything else about them). There were these (presumably) great lightsaber fight scenes which were filmed from exactly two angles: so far away that the combatants were three inches tall on a fifty-foot screen, and so close that a single lightsaber occupied nearly the entire screen. Neither perspective allowed the viewer to see a damn thing about the choreography, and the editing cut between the two perspectives every few seconds. I could have forgiven Lucas’ total inability to tell a story if he had allowed his action scenes to shine, but nooooo. While I’ll admit to actually liking the Darth Maul duel in “Phantom Menace,” I agree that none of the other lightsaber fights in the new Star Wars trilogy were very well executed. For me, they suffered from the same conceit as the movies themselves: MORE! MORE! MORE!! And they actually became LESS! LESS! LESS!! I think the best duel of the series was in Empire Strikes Back, and that was just old-school, fencing-style sword fighting. Just a nice series of lunging, blocking, parrying, etc. No crazy gymnastics or constant flipping and jumping like superheroes all over the place. No multiple lightsabers. No constant use of The Force to push things away or knock things down. Sure, there was a little bit of those elements in the fight, but for the most part, it was just a straight-up sword fight that relied more on tension than anything else. I couldn’t agree more. While we’re at it, tell Hollywood to STOP WITH THE SHAKY CAM! It renders most action sequences completely unwatchable. there is so much awesome in the first panel i think my head might actually explode. Ha ha! Thanks!! Glad you like it!